Recently, Brig. Gen. Mark R. August, 86th Airlift Wing commander, sat down with American Forces Network-Kaiserslautern to introduce himself to the Kaiserslautern Military Community. Q: What was your previous assignment and job? 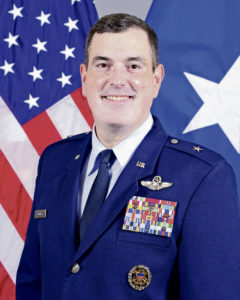 A: Prior to coming back to Ramstein to command the 86th AW, the ‘world’s best wing,’ I was out at Scott Air Force Base, Illinois, I was the deputy for all operations for Air Mobility Command. Q: This is the third time you’ve been stationed on Ramstein, correct? A: This is my third time back in the 86th Airlift Wing. We started here in 1995 and came back in 2007 — got a chance to command here. I was offered the opportunity to come back one more time; it’s a job you just can’t refuse. It’s the best job in the Air Force. Q: Out of all of your as­sign­ments, not counting this one, which was the coolest one? A: For me, it’s actually simple. It’s back here at Ramstein. When I was a squadron commander over on the Ramstein side, when we were converting from the C-130E Hercules to the C-130J Super Hercules, it was the first time since World War II that a unit had transitioned aircraft while engaged in combat operations in more than one area of responsibility. Q: What are you most excited about as the commander of the 86th? A: It’s an amazing opportunity to come back and command any organization, but as I mentioned before, this is amazing to be a part of this organization again… We are U.S. Air Forces in Europe’s sole airlift wing. If something needs to be moved, we’re going to be the team who does it. But because we also run four air bases in four countries, we present a strategic center of gravity that equals no other installation. Q: What are your priorities as the new wing commander? A: First and foremost, we’re an airlift organization. So PROFESSIONAL AIRLIFT is always going to be the marching orders… Whether you’re working in the dental clinic making sure folks are ready to deploy or get out the door, or you’re working in civil engineering making sure the runway is working, that’s a big part of what professional airlift is. When you look at the four bases we run, the second priority is really about those strategic centers of gravity – being a GATEWAY TO THE WORLD able to interface with the folks in Belgium, Spain, and the Azores. That’s a critical part of what we do. My third priority is TAKE CARE OF OUR AIRMEN. Some people say, ‘Sir, that’s just a bumper sticker. The Air Force talks about that all the time,’ and for me it’s a little bit different. I define that as first and foremost giving folks a command climate where they feel like they have a chance to succeed, especially when we start talking about innovation, when we start talking about improvement, it’s okay to try and fail as long as we learn from our mistakes. The second part of taking care of Airmen is making sure we have the resources we need… And finally it’s getting Airmen the recognition they deserve. We’ve got a lot of folks in the KMC who work for this wing who are too good to go unnoticed. So my job is to help folks get some serious awards. Number four is ENGAGEMENT. Be an ambassador, because living overseas is an amazing opportunity for all of us. I’ve commanded overseas; I know what it’s like to live overseas and the experience of living here in Europe has no equal. Finally, it’s PREPARE. Be ready, because there’s so many things going on in the world right now, our theater expects us to look to the east to assure our NATO allies, to detour our adversaries and be focused on the south as well. We’ve got a lot of operations in Africa so we need to be ready to deploy at any time. August plans to be on the radio regularly, so tune in to FM 105.1 to hear his next broadcast.